A cooperative of beekeepers in Northern France filed a legal complaint against Monsanto June 7, the same day the company was acquired by the German chemical giant Bayer, after finding the company’s infamous weedkiller in their honey. One of France’s largest honey companies, Famille Michaud, found the chemical in three batches of honey supplied by a member of a 200-member beekeeping union. “They systematically analyze the honey shipments they receive, and they found glyphosate,” head of the beekeeping union Jean-Marie Camus told Agence France Presse. “We regularly detect foreign substances, including glyphosate,” Vincent Michaud, president of Famille Michaud told AFP. If glyphosate is found, the supplier’s entire shipment is rejected, Michaud said. 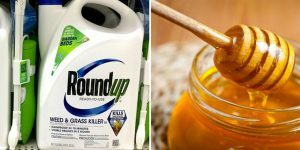 The supplier of the tainted honey lives near a field of rapeseed, beets and sunflowers, where RoundUp is likely used, Emmanuel Ludot, a lawyer for the cooperative, explained to AFP. “But you also can’t forget the weekend gardeners who often tend to use Roundup,” he added. The beekeepers’ union hopes their action will prompt an investigation to determine the percentage of glyphosate in their honey and whether it could lead to any health problems. “It’s also a matter of knowing how widespread this might be — Famille Michaud tells me this isn’t an isolated case,” Ludot said. The European Union member states voted to renew the license for RoundUp for five years. French President Emmanuel Macron, however, has vowed to ban glyphosate within three years. Monsanto faces more than 2,000 lawsuits in the U.S. alone over Roundup cancer claims. The FDA found glyphosate in U.S. honey in 2016, but American beekeepers haven’t yet taken legal action. Bayer, who now owns Monsanto and the liabilities surrounding it, plans to drop the company’s infamous name, but maintain product names like RoundUp. A friend from Missouri sent me a noteworthy article….that Roundup, aka glyphosate,is applied to grain crops, especially wheat, one week before harvest to “dessicate” the crop!! I pursued this and found it to be all too true in the US & Canada. Absolutely insane! Your thoughts please…. Thank you for this information. Glyphosate needs to be illegal in every country. This is true for wheat, oats, barley and other grain crops. RoundUp Ready wheat was developed but not allowed a license in the USA so they found a back door and spray it on all grain crops right before harvest. It’s supposed to act as a desiccant and prevent mold while being stored in a silo. The only safe thing you can do is only buy organic products made with wheat, oats, etc. That includes flours and anything made with flour. Monsanto will drag this lawsuit in court for years or bury it with a private settlement. It’s all about the money. Let’s hope more will come out of this instead of a cash settlement! No more honey for me ! i used to like honey but to risky now. Our min pin just suffered and died a violent , painful death as a result of neighbours using roundup, KILLX, and another deadly poison. It says on the label that you have to let your neighbors know when you use it so you can protect your small animals. No such respect shown. Now our min pin ‘a best friend, a Yorkie, is suffering and dying.